The story behind this p/s is well known. Penniless band can't afford to get expensive sleeves printed up so they manage to lay their hands on a whole bunch of spare sleeves from well known bands of the time and made them their own! Legal threats were handed out but never pursued. Here is the Chic variation of the sleeve. I wonder what Nile had to say? The Chaka Khan sleeve seems to be slightly more common and has been documented elsewhere. 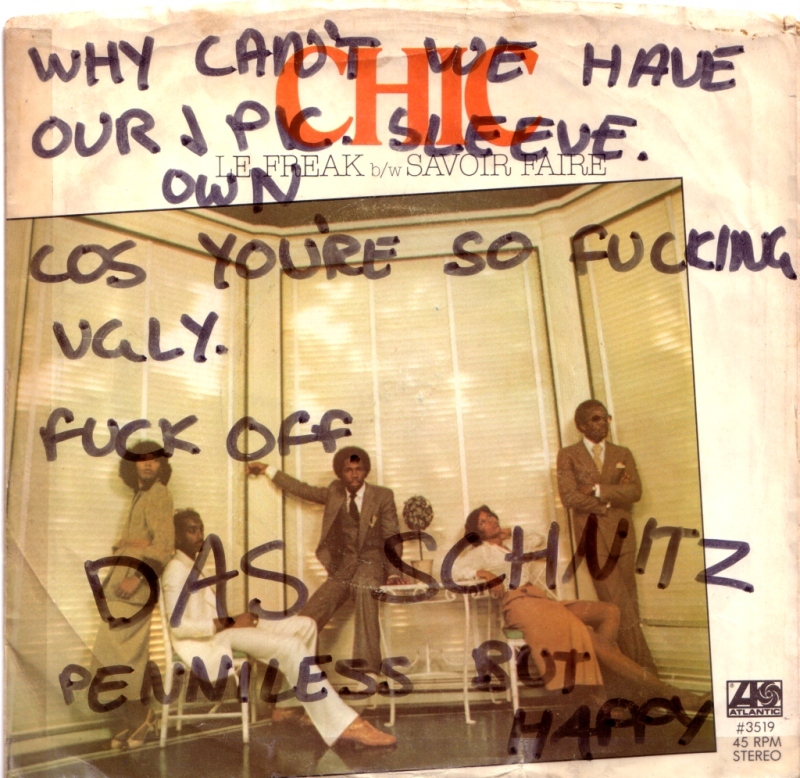 This variation is also more offensive and therefore more pleasing than the other copies I have seen. "Hedge Pigs" on the back of the sleeve refers to local rivals "The Hedgehogs". Das Schnitz were formed in 1977 by four school pals from Torquay Boys Grammar school. Nadi Jahanggiri (Guitar), Kevin Perry (drums), Tim Dodge (vocals, and myself Stu Gordon (bass). 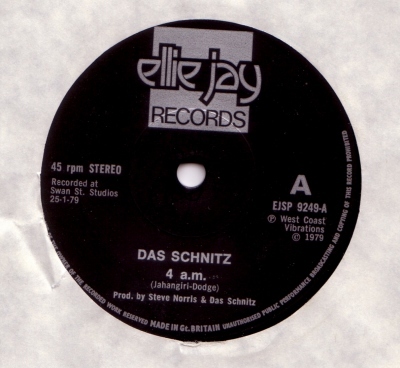 Das Schnitz were not the first band to come out of our school. That honour goes to Wishbone Ash. After a few months of strenuous rehearsal and posing around town we had learned two songs! Something needed to be done. A girlfriend arranged for a gig for us at a lunchtime charity disco at the girls grammar. The pressure was on! Over the weekend I came up with four original songs "Frozen Zone", "You used to be my Girlfriend", "Reflections" and "Young Socialist". Not the greatest songs ever written but they were 'our songs'. The gig on Wednesday 19th April 1978 was a great success. We played our four songs to about 300 screaming girls, must have been like a Busted gig. That was it, we were cooking. We wrote more songs, learned some other covers and played continually around Torbay and South Devon. We played mainly youth clubs and teenage discos as our fan base were nearly all under 18. 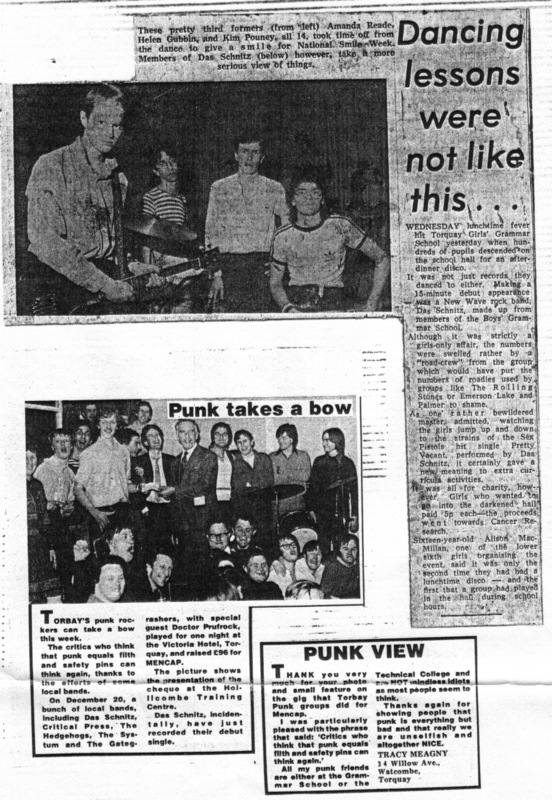 We did support some spots for bigger bands visiting the area, The Vibrators, The Lurkers, Tonight etc.. By the end of 1978 I had started to get a little disillusioned with the direction of the band, they seemed to be drifting into the realms of 'power pop'. I wanted something with a harder edge and left falling in with a band called QNX?. I was replaced in Das Schnitz by a likeable easygoing guy called Tony Morrel. 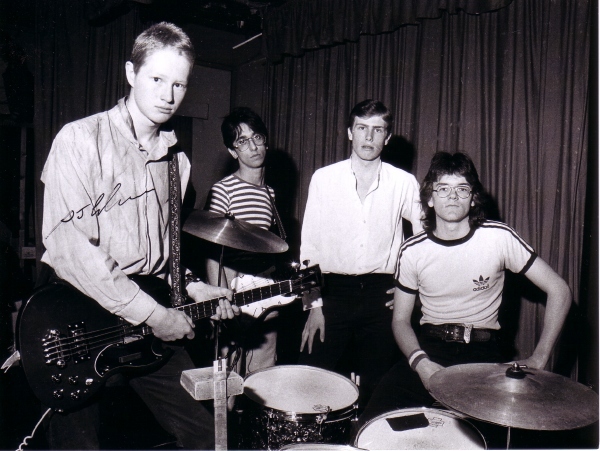 The Schnitz had formed their sound and after a few gigs in the new configuration they went into Swan Street Studios in Torquay and recorded the single '4 am' produced by the studio owner Steve Norris. Sadly the street was bull-dozed to make way for a new development and the studio with it (circa. 1985). 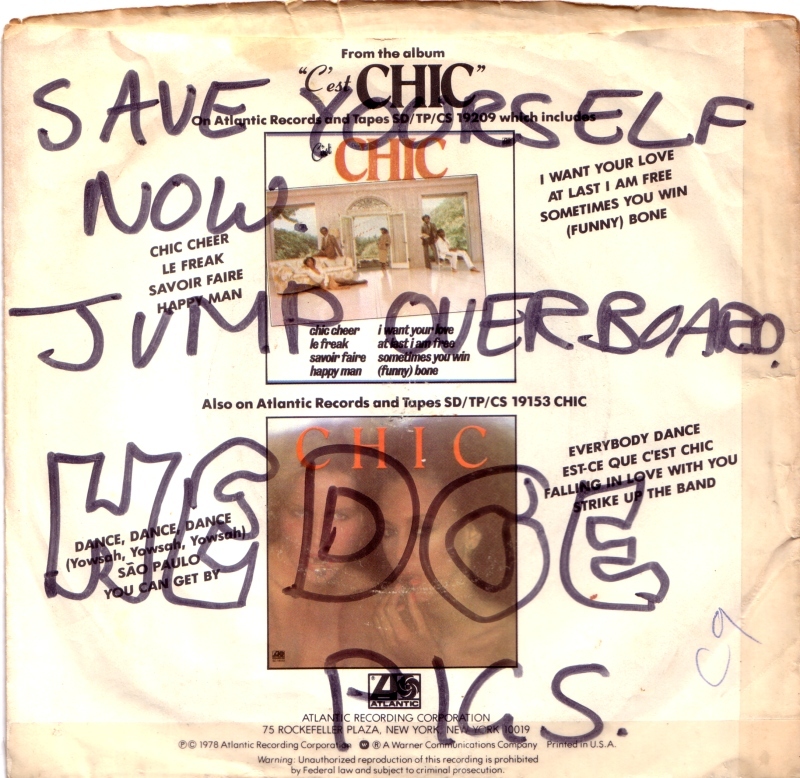 The single was originally only available in local Torbay record shops or from the band and sold quite well. For one week it was the second top seller in Torbay only held off number one by Art Garfunkel's Bright Eyes. Not long after the band split as guitarist Nadi left to go to university in Liverpool to study Architecture. He is now a very successful architect in London. I ended up playing with Tim and Kevin again some months later in a band called "Rhythm on 2" a mod/sixties revival band. They had a short but successful life locally playing clubs and pubs and supporting Ultravox (Vienna tour), The Lambrettas and The Merton Parkas at Torquay town hall. Rhythm on 2 eventually split when Tim, Kevin and Guitarist Gerry Smith drifted away to college. Tim to catering and banquet management and Kevin to be a graphic artist. I continued to work in Torquay and still played in bands, one of the last being Ulterior Motives a proto goth/industrial band (from sunny Torquay!!). I joined the RAF in 1983 and that was it for me until about three years ago when I decided to do something again. I now play in a pub rock band called V-Red doing a mixture of classic rock covers and our own stuff (including a couple of rocked up Ulterior Motives numbers). V-Red play regularly around pubs and clubs on Teesside and the North East where I now reside. When we first formed we struggled to come up with a name, "Small Pink Rubbery Ambulance Men" and "Mother Coffee and the Slow Motion Foot Stompers" were touted but rejected. I was a big Ramones and Patti Smith fan and wanted something with a New York street feel. The music press used to call the Ramones "Da Bruddas" or "Da Ramones" effecting that dumb New York punk language. So I came up with "Da Schnitz" (sic.) which sounded right. The name was accepted but somehow that 's' got added changing it completely. It now sounds Germanic and I believe it has something to do with wood splinters in translation. Oh well, the 's' stuck and the rest as they say is History!! !